Ralph attended the University of Tennessee, received a BS from Lee University, and a Masters Degree from Salisbury University. He has taught high school, been a coach, counselor, vice principal, and principal. As supervisor of instruction for Wicomico County Board of Education, Ralph was responsible for teacher training and curriculum development. Linked with his love for teaching, Ralph has been providing financial guidance to individuals, families, and businesses for over 25 years. He believes the greatest education is the one not taught in our public schools. Ralph and his wife, Beth, have been married for over 40 years and have one son-in-law and daughter, along with two beautiful grandchildren. Ralph holds the Series 6, 63, and 26 securities registrations. He is also licensed for Life and Health Insurance. He is active in his local church, and has received numerous civic awards for his years of community involvement. With the heart of a teacher and more than twenty-five years of financial experience, Ralph and the Osborne Financial Group, LLC provide numerous tools to help guide you and your family to financial freedom. Fun Fact: Ralph is an avid fisherman and often travels to Alaska to participate in world-class fishing expeditions. He has quite a trophy collection right in his office! 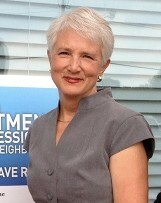 Linda has been serving clients in the financial arena for over 35 years. It began with her marriage to husband Jeff who was finishing his accounting degree and subsequently opened his own CPA practice. In order to better advise clients with their investment needs, she added credentials in life insurance and securities. Having tax advice and investment guidance in the same practice has been extremely beneficial. Education has been a key ingredient of Linda's career. She received her B.A. in English from Asbury College and her M.A. in English from Eastern Kentucky University. She has taught English in business school, high school, and college, and finally retired her "red pen" in 2005. In 1998, Linda became choir director for a local Methodist church where she still serves combining a love for music and teaching. Her two children, Daniel and Joran work in finances as well. Her grandson, age 10, is planning to open a pizzeria when he turns 15. Nana will eat free of course! She is credentialed with Series 6, 63 and 65 securities registrations along with life insurance licenses in multiple states. Investing in people is the only investment that has lasting value, and it is Linda's heart to teach, encourage, and guide clients to not only financial success but also to have hope for a better future for themselves and the ones they love.